Before SciFi Channel becomes SyFy, they must make us watch garbage. And after they become SyFy, they STILL must make us watch garbage! Sand Serpents sounds like someone liked Dune a little too much and decided to turn that into a SciFi Channel creature feature. So they did. 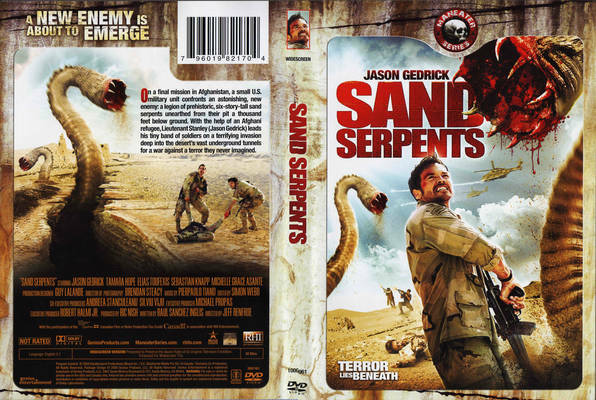 Directed by Jeff Renfroe and starring Jason Gedrick, we have US soldiers chasing the Taliban, who find out they are now the ones being chased by the Sand Serpents! Watch it July 11th. Hellhounds is directed by Silver Spoons himself, Rick Schroder. It involves hounds that are in Hell, because some dude in ancient Greece has wandered into there to go get his girlfriend. I guess he brings other people with him, otherwise the Hellhounds won’t have any doggy snacks. Will Cerberus show up? Find out July 19th. Malibu Shark Attack is next on July 25, it used to be Goblin Shark Attack and is about a Goblin Shark that attacks. In Malibu. Peta Wilson will defend people from goblin sharks that are released after an earthquake opens an underground lake. 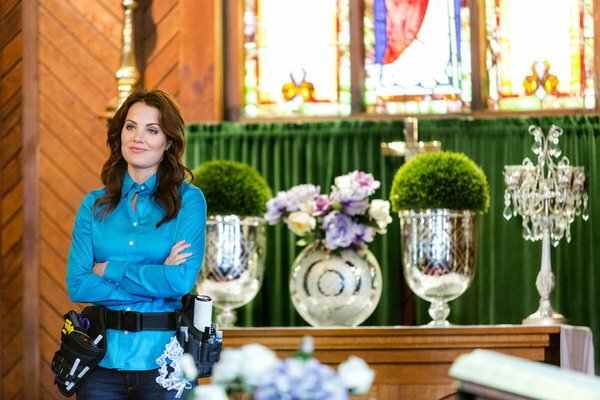 Chelan Simmons also costars, she has fought giant bugs, ogres, chupacabras, and snakehead fish before on SciFi Channel, so freaky sharks should be no biggie. Infestation will premiere August 8th. The official site has stuff for you to check out. Fast and Ferocious shows up August 11th. No one knows anything about this film yet, so it is probably something else renamed. Hopefully it involves Vin Diesel racing cars against mutant cheetahs. High Plains Invader then arrives August 30th. It used to be called Alien Western and stars James Marsters vs a bunch of giant bugs in the old west. SciFi Channel will also be showing a bunch of stuff from The Asylum, with Mega Shark vs. Giant Octopus airing August 29th, Transmorphers 2: Fall of Man airing August 1st, and The Terminators airing August 15th. On the next Star Trek: Deep Space Nine: Chief Miles O’Brien fights giant rhinoceros beetles! Well, that would still be better than that stupid baseball episode. Instead, we get another average SciFi Channel movie. Unlike some of their other movies, this one is not so terrible you want to gouge out your eyes and ears to become blind and deaf to the world. Now, that doesn’t make this movie any good. It is just as far from good as it is from bad in many places. In fact, at some points it’s laughable, and several of the characters are never in any danger at all, as the movie is incapable of doing anything inventive like kill off a member of the main family. The problem with the predictability is the film becomes uninteresting. While not committing the ultimate SciFi Channel sin of being boring, it is not anything you’d sit around and catch the second running of. Watch, rinse, forget. Not many films are brave enough to specialize an obscure beetle, but I bet the writer saw a special on the Discovery Channel that mentioned that rhinoceros beetles are proportionally the strongest animals on the planet. Some gears started to crank, electricity began to flow, the light bulb started to flicker…Bingo: make them huge! That also somehow makes them prehistoric, and meat eaters. Since real rhinoceros beetles only eat fruit and rotting wood, they are only dangerous to Jack Pumpkinhead from The Marvelous Land of Oz. He is nowhere to be found, though it would have made the film that much cooler. Instead of that weird fun, we have to put up with the Palmers. Not the Palmers from 24, but these are some professional outdoors adventure guides who show rich people around in the outside while overcoming the troubles of modern families like homework and teenage girls hogging the bathroom. Caved In: Prehistoric Terror follows the Type B SciFi Channel monster movie formula: Large Swarms of similar creatures with a Giant Queen terrorize a group (similar films: Pterodactyl and Snakehead Terror.) Type A SciFi Channel monster movie formula: A singular or small group (4 or less) of monsters terrorize a group(similar films: Frankenfish and Manticore.) Type C SciFi Channel monster movie formula: A swarm of monsters with no queen terrorize a group (similar films: Komodo vs. Cobra and Curse of the Komodo.) Now that we’ve outlined the basic three plots, we can jump into the film itself, starting with the characters.